Gloucester (blind): Is’t not the king? Lear: Ay, every inch a king. After the great London fire of 1666 wooden buildings were completely prohibited in that city. American film director Sam Wanamaker was able to wring an exception from the powers that be so that a faithful replica of the Globe could be built near its original site on the south shore of the Thames. 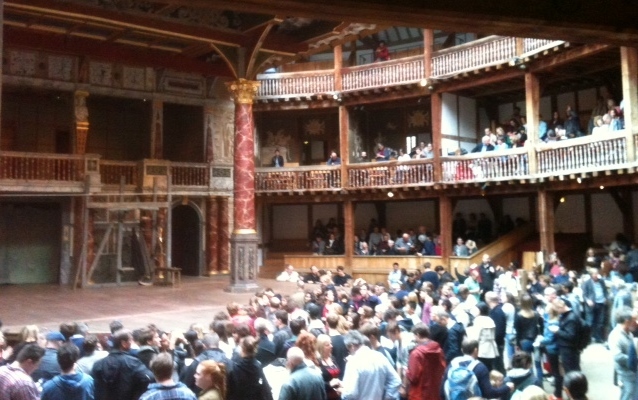 Shakespeare’s Globe Theater opened in 1997, allowing every English major’s dearest wish to come true. At the end of August my husband and I were able to attend an evening performance of King Lear and were delighted with the experience. This was the view from my seat as the crowd gathered before the play. 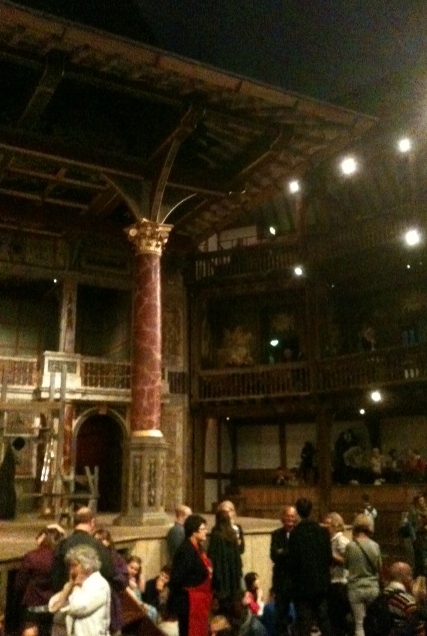 There were three levels of seats plus the center space for groundlings. All pictures were taken on my phone. Many of you will remember learning about the structure of the original Globe Theater which developed from the courtyards typical of inns of Elizabethan times. The main stage was a few feet above ground. One small enclosed stage space behind the main stage was useful for interior scenes. An upper stage directly above that was useful for scenes requiring a balcony or an appearance at a higher level. People in the audience could sit on benches arranged in three circular levels, protected from the weather. Theater-goers with the cheapest tickets stood in the open space at the heart of the theater – giving them the name groundlings. There was no roof over the central space, as the light for the performance was daylight. During intermission many groundlings sat on the floor. The sun had set so electric lights provided illumination. The new construction follows the old model with a few exceptions. The groundlings still stand; no substitute seating devices are allowed. I noticed that people arranged themselves rather closely on the ground, with shorter people at the front, all standing absolutely still. When the drizzle began people pulled up their hoods. Umbrellas are not allowed. There was non-Elizabethan electric lighting for the stage. The lights shining onto the stage when the performance began at 7:30 PM gradually took on the job of illuminating the space as the evening progressed. Sounds from outside the theater did not intrude except for a few jets passing overhead. I could not discern any assistive sound amplification for voices or music. It all felt very authentic. Costuming was not elaborate – more suggestive than exact. 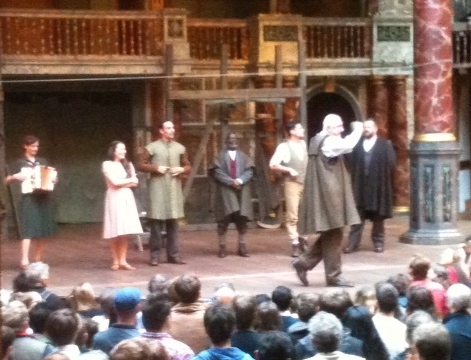 Most of the actors (all but the man who played Lear) played more than one part. In one case a man had to run across the stage a few times to answer his own questions while another patient actor posed other comments! The three female roles were played by women (rather than by men as would have been the case originally). The multiple role actors-musicians warmed up the crowd before the play began. My husband asked me to brief him on the plot before the performance. Realizing that my recollection was fragmentary (despite a few very clear images) I found the Cliff notes online and we both reviewed the story. As usual, we found that getting into the meter and idiom of centuries-old blank verse required our close attention at the start of the performance. We were both amazed at the how much difference it makes to see the story acted out. Reading a Shakespearean play allows you to puzzle out the meanings (and footnotes) at your own pace for better understanding. But when you see and hear it presented, you get the jokes, the double entendres, and the intent of each comment with no effort. Apparent lack of scenery is not a drawback at all. The scene where mad Lear and his companion Fool are braving the storm on a heath was suggested only by “thunder” created by shaking a sheet of metal (which we could see), a curtain made to billow behind them implying strong winds, and their own actions, arms and voices raised against the weather. It was very convincing – more so than a “realistic” film presentation would have been. At the end (spoiler alert) when Lear carries out his favorite daughter Cordelia, now dead, there was nowhere else to look but at his palpable grief. The bare stage was the perfect setting to focus everyone’s attention on all that Lear had lost, now lying still in his arms. This was one of the most moving grief scenes I have witnessed. If you are interested in Shakespeare, drama and the power of imagination to fill in gaps of representation, do make space in your calendar and travels to see an authentic performance (at this London theater if possible). Remind yourself of the plot ahead of time, but be prepared to be swept up in ways you would not have expected! This entry was posted in Travel, Uncategorized and tagged actors, costume, Globe theater, King Lear, London, travel, William Shakespeare. Bookmark the permalink.